Mercedes Formula 1 boss Toto Wolff says the controversial award of double points at the final race risks "overshadowing" the season. 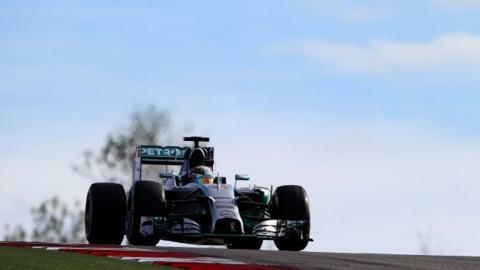 Lewis Hamilton leads Mercedes team-mate Nico Rosberg by 24 points with two races to go. But Hamilton could win in Brazil this weekend and still lose the title if his car hits trouble in Abu Dhabi. "The last race with double points has the potential to overshadow the season," Wolff said. "We know why the double points came - and it made all the sense in the world to make it spectacular for the viewers - but now we're in a situation where it could change the outcome." There are 25 points for a win in Formula 1 and 18 for second place, but the scores will go up to 50 and 36 respectively in Abu Dhabi. Mercedes have been so dominant this season - Hamilton has 10 wins while Rosberg has four - that one of their drivers will almost certainly win both remaining races. If Hamilton wins in Brazil with Rosberg second, his lead would increase to 31 points going into the final race. A second place would be all Rosberg needed in Abu Dhabi in that scenario to beat Hamilton to the championship if the Englishman failed to score. If Rosberg beats Hamilton into second place in Brazil on Sunday, he would cut his deficit to 17 points, in which case Rosberg would need only a fifth place in Abu Dhabi to be champion in the event Hamilton did not score a point. Hamilton said: "You can't think about it. It's a fact that it's a possibility but it's not something I'm willing to accept. "I want to win the next races, I want to get as many points as I can. It's not something I can be thinking about. "If you live your life with 'what ifs' you might not achieve what you want to achieve." Rosberg said after finishing second to Hamilton in the US Grand Prix on Sunday: "It's becoming more difficult but it is definite that in the last race I have a chance to win." Ahead of the race in Austin, Rosberg said: "It is a bit artificial, the double points. My opinion is keep it straightforward, which is the way F1 has been forever. "But maybe it's not contemporary any more and we need to rethink it and maybe it is important to keep it exciting all the way through because we have had a couple of seasons when the drivers' championship has been decided early and that is the worst thing that can happen."